Martin has been a professional artist since 1986. Beginning his freelance career with Marvel UK, on titles including, Transformers, Thundercats, Ghostbusters, Action Force and Doctor Who. In the early 90’s Marvel UK begin producing comics for the American market. Martin contributed to titles including, Knights of Pendragon, Deaths Head, Killpower and many more. This led to working with other companies. He signed a one year contract with the Daily Mirror newspaper producing art for the Teenage Mutant Ninja Turtles daily strip. 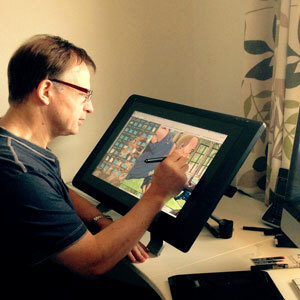 Martin branched into advertising, producing storyboards and animatics for most well known brands. Martin has worked on television ads including clients, Guiness, Mars, BT, BMW and Audi. Freelancing for top visualising studios, Smudge Pencil, Helicopter Grafix, Storyboards and Stage One. Martin has taken up writing and has completed his first screenplay for his own created characters called Microscopic Aliens and six episodes for a sitcom called Time And Time Again. He is now turning Microscopic Aliens into a graphic novel. This has been previewed on Aces Weekly, an online digital comic. Martin attends comic conventions where he can be found sketching, signing, selling prints and meeting comic fans. Martin lives in Essex with his wife Jan and their dog Lucy. On the menu are links to various sections of Martin’s Portfolio. You can click on any of the images to take you to the relevant section, each of which contains a number of artwork examples from each of the various fields Martin has worked in. You can also visit his Sketchbook and Concept Art pages. If you would like to get in touch with Martin to discuss anything artwork-related, you can contact him via the Contact page of this website.